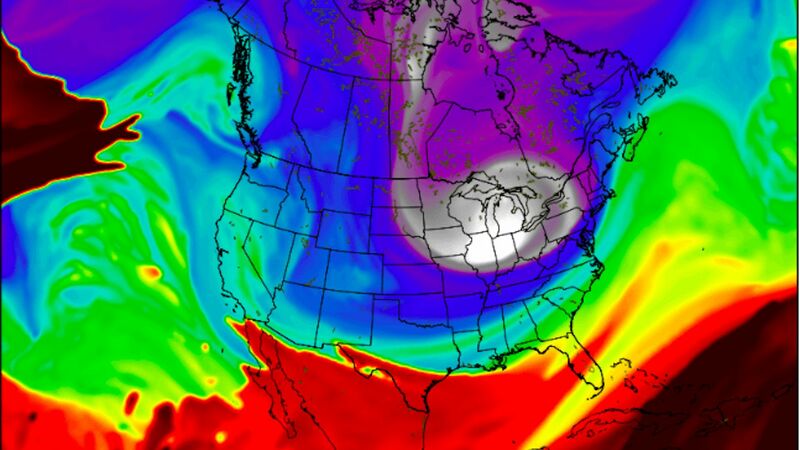 The coldest air of the season will roar into the Midwest and Ohio Valley next week as a lobe of the polar vortex comes south from the Arctic Ocean. The cold will eventually reach the Mid-Atlantic and Northeast. Why it matters: The extreme cold outbreak may set daily temperature records, including records for the coldest high temperature on a particular date. It's also possible that an all-time cold record or two will be tied or broken. Temperatures hovering in the single digits or lower on Wednesday and Thursday in cities such as Minneapolis, Chicago, , Milwaukee and St. Louis, combined with the wind chill, will make it downright dangerous to be outside at times. The details: By early next week, a lobe of what's known as the tropospheric polar vortex will wobble outside of the Arctic to take up position above the Midwest. This will bring with it high temperatures that will struggle to get above 0°F, and overnight lows on Tuesday through Thursday will plunge well below zero. Overall, temperatures look to be between 30°F and 40°F below average for this time of year, though some computer model guidance suggests it could be even colder in the Great Lakes region in particular. About 200 million people in the U.S. will see temperatures dip below freezing next week, based on model projections. For example, the current overnight low temperature forecast for Chicago on Wednesday is minus 17°F, which is frigid, but nowhere near the city's coldest high temperature on record of minus 27°F, set in January 1985. Wind chills on Wednesday morning could reach the minus 60s°F in parts of Minnesota and Wisconsin. Computer models still differ on the magnitude of the cold, but it's unlikely that many all-time cold temperature records in the Midwest — typically one of the coldest regions of the country during winter — will be broken during this event. Partly this is due to the intensity of the cold air mass, but it also reflects shifts in the background climate. As the Earth has warmed over the past few decades, record cold weather still occurs, but is getting less likely. Meanwhile, the likelihood of hot season extremes is becoming more likely. Even the infamous "polar vortex winter" of 2013-14 failed to set a slew of all-time cold temperature records, though it did cause many daily records to tumble. This cold snap, like the one earlier in the month, has its roots high above the Earth's surface. Meteorologists have been closely watching weather patterns ever since conditions in the stratosphere, about 100,000 feet aloft, suddenly warmed about 5 weeks ago. This is known as a Sudden Stratospheric Warming event. The bottom line: It's going to get unusually cold across a large swath of the Lower 48 states during the next week, and the cold will not let up quickly. The frigid weather may be accompanied by some snow across the Great Lakes and Northeast as well.